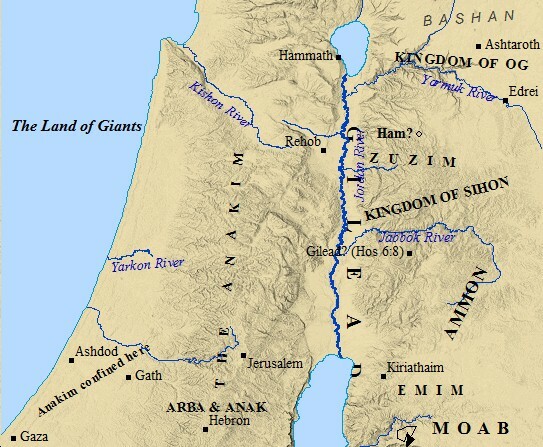 OLD TESTAMENT Bible maps depict different routes taken by Moses during the Exodus. A highly controversial event in the modern era of archaeology and science, this remarkable Exodus from Egypt took place during the reign of an unnamed Pharaoh, probably from the 18th or 19th Dynasty. Click on a link to view that Old Testament Map. THE EXODUS After the miraculous crossing, helped by a strong Eastern wind sent by God Almighty, the Israelites escaped into the Sinai. 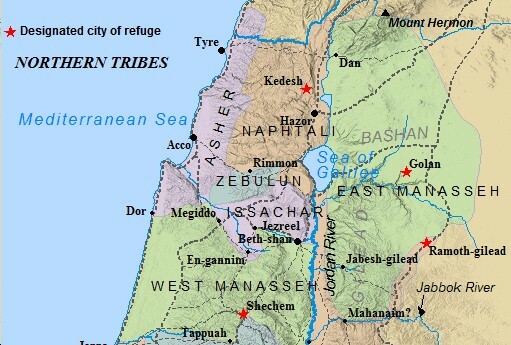 Old Testament Bible maps depict various routes as being taken by the Israelites. A Byzantine tradition claims Jebul Musa, in the southern Sinai, is Mt. Sinai. A monastery was built on the site. This site, however, is unlikely the Mt. Sinai of Moses. 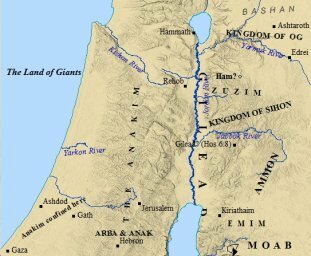 Old Testament Bible maps differ on the location of Mt. Sinai as well. 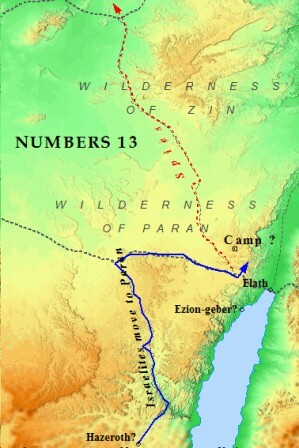 MOSES moved the Israelites northward from Hazeroth to the Wilderness of Paran, as told in Numbers 13. Previously, in Hazeroth, "the anger of the Lord burned" against Miriam and Aaron for speaking against Moses. From their camp in Paran, God instructed Moses to send 12 spies into the land of Canaan. One spy was to come from each tribe, and they were to scout out the land, obtaining samples of produce, and assessing the size and fortifications of the cities. Joshua was one of the spies, representing the tribe of Ephraim . Caleb was another spy, representing the tribe of Judah. These two great men would play instrumental roles in the upcoming Conquest. Their tribes were blessed because of their faith in God. NUMBERS 13:21 tells how the Israelite spies searched out the land as far as "Lebo-hamath", which translates as "the entrance of Hamath". The spies are said to have cut down a cluster of grapes in the valley of Eshcol, a single cluster which they had to carry on a pole between two men. Eshcol was also the name of an ally of Abraham, in Genesis 14:13. Abraham dwelt near the oaks of Mamre the Amorite, brother of Eshcol. Near Hebron, the spies encountered the sons of Anak, reported in Numbers 13:33 to be a part of the Nephilim . All but two of them reported; "the land through which we have gone in spying out, is a land that devours its inhabitants...". Only Joshua and Caleb remained faithful, and encouraged the people to go up and take the land God will give them. As a result, God gave Caleb the land of the Anakim. It was during the campaigns of Caleb the Anakim were driven to the Coastal Plain. THE LAND OF GIANTS may sound somewhat fantastical when describing the ancient land of Canaan. However, the Bible paints such a picture. The sons of Anak, the Anakim, are said in Numbers 13 to have been occupying Hebron, and likely the Central Highlands north of Jerusalem. In Deuteronomy 2 the land of Ammon is said to belong to the Rephaim , a people as great as the Anakim, and also connected to the Nephilim giants in Genesis. Og, the giant king of Bashan, was the last of the Rephaim, and king of the Amorites. Deuteronomy 3:11 gives the dimensions of Og's bed as over 14 feet long, and over 6 feet wide! I Samuel 17:40 depicts the battle between David and Goliath, the giant Philistine from Gath. Caleb drove the sons of Anak from their land, and forced them to migrate west, where they merged and assimilated with the Philistines. I Chronicles 20:6-7 speaks of another Philistine giant, "a huge man with six fingers on each hand and six toes on each foot - twenty-four in all." OG & SIHON were the "kings of the Amorites who were beyond the Jordan" (Josh. 2:10). The Israelites encountered these two Amorite kings in Numbers 21. Moses sent messengers to Sihon, king of Moab, seeking permission to pass through his land. Moses assured Sihon the Israelites would not disturb the land nor the people. Sihon, however, refused and gathered his troops for battle. This proved a fatal mistake, as God gave the Israelites victory over Sihon. Scripture records his brother, Og, king of Bashan, then gathered his troops. The Lord assured Moses victory, and handed Og over to the Israelites. 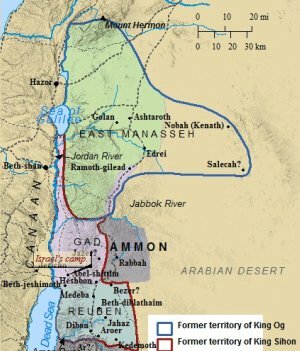 The tribes of Reuben, Gad, and Manasseh asked Moses for this land east of the Jordan. These tribes became known as the Transjordan Tribes of Israel. JERICHO As Moses died, and Joshua rose to leadership, God was ready to advance His people into the Holy Land. 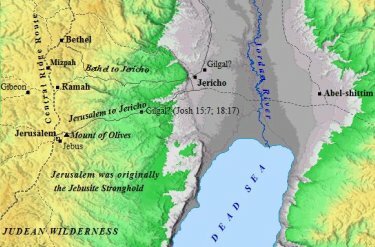 Old Testament Bible maps attest to the importance Jericho played in the Conquest. The city was not chosen randomly. 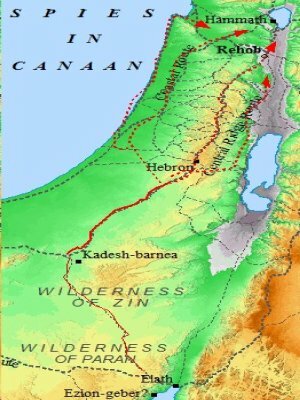 If Jericho were taken, the Israelites would control three routes leading into Canaan. After the battle of Jericho , Joshua would move northwest and take Ai. Thus began the Southern Invasion of Israel. THE BATTLE OF JERICHO Old Testament Bible maps shed light on the strategy involved with taking Jericho first. Joshua encamped at Abel-shittim, a natural spot to camp before crossing the Jordan. It was from Abel-shittim the spies were sent out to Jericho. There they encountered Rahab the harlot. 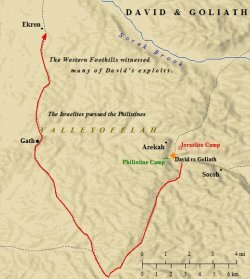 After the spies returned safely back to camp, Joshua moved the Israelite camp to the shores of the Jordan. For three days the Israelites camped here. God, then, stopped the flow of the Jordan in Adam, north of the Israelites, and provided a miraculous crossing on dry ground. JOSHUA SENT SPIES AHEAD FIRST. THEY ENCOUNTERED RAHAB, WHO SAVE THEIR LIVES. JERICHO WAS ON THE JORDAN PLAINS, AND LED INTO CANAAN. IT'S LESS THAN 20 MILES FROM JERUSALEM. JERICHO BECAME JOSHUA'S MAIN BASE. After crossing the Jordan, Joshua moved the Israelites to Gilgal. Before going into battle, however, the Israelites had to consecrate themselves to God, thus, they were circumcised as a nation for the first time in forty years. It was also in Gilgal Joshua encountered a visitor, an angel of the Lord's, perhaps the archangel Michael. From Gilgal, the Israelites marched on Jericho. The city fell to Joshua, and opened up the way into Canaan. 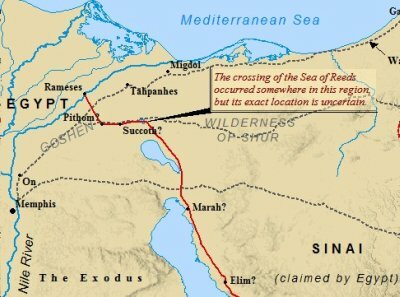 Old Testament Bible maps, such as the one below, portray the importance of roads such as The Central Ridge Route. Shechem, Bethel, and Jerusalem all rested on this route, and control of this route was essential. THE BATTLE OF HAZOR The ancient city of Hazor was a key Canaanite city in the north of Canaan. Joshua 11 depicts the Israelite victory over the Canaanite forces at the nearby Waters of Merom. Hazor, according to Joshua 11:10, was the "head of all those kingdoms". This victory severely crippled the Canaanite ability to resist the Israelite invasion in the north, and opened up this territory for occupation. The Bible records Joshua and the invading army of Israelites burned Hazor with fire. Excavations have shown that shortly before 1200 B.C., the Upper and Lower cities of Hazor were violently destroyed by fire. 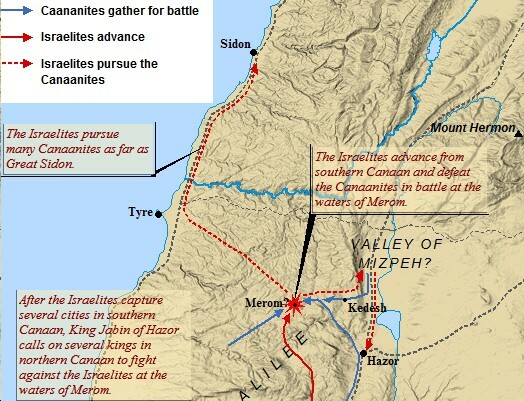 Old Testament Bible maps make mention of the Battle of Hazor due to its significance in the Northern Campaign of the Conquest. THE NORTHERN TRIBES OF ISRAEL would eventually constitute the Northern Kingdom of Israel. Old Testament Bible maps clearly show the size and scope of the Northern Kingdom surpassed that of the south. 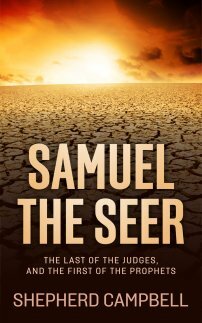 After the death of Solomon, the Northern Tribes split from the Southern Kingdom of Judah. The southern throne remained with the tribe of Judah in the south, and was headquartered in Jerusalem. The Northern Tribes elected Jeroboam I as their king. Israel tended towards idolatry more so than their southern brethren. The Northern kings set up places of worship at Dan and Bethel, profaning the name of the Lord. Though much larger and more powerful than the Southern Kingdom of Judah , Israel fell to the Assyrians nearly two hundred years before the kingdom of Judah would fall to the Babylonians. THE SOUTHERN TRIBES OF ISRAEL were centered around the tribe of Judah, by far the largest and most prestigious of the three tribes. 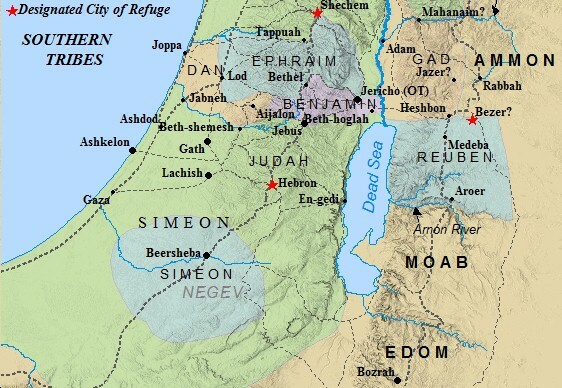 The tribes of Benjamin and Simeon rounded out the remaining tribes. Old Testament Bible maps sometimes group these three tribes under the Southern Kingdom of Judah. In a remarkable testament to longevity, the throne of the southern kingdom never passed from the family of David, in the tribe of Judah. For nearly five centuries the house of David sat on the throne of Judah. The Southern Kingdom fell to Nebuchadnezzar II in 586 B.C. 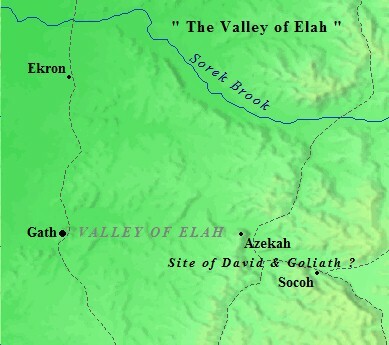 VALLEY OF ELAH Old Testament Bible maps track the exploits of David from his youth to the days of his kingship. It was in this region many conflicts took place between the Philistines and the Israelites. The Israelite and Philistine armies were encamped across the valley from each other, perhaps the intersection between Azekah and Socoh. Goliath would emerge each morning from the Philistine encampment and stand in the valley shouting his challenge to the Israelite army cowered on the opposite hillside. I SAMUEL 17 records the encounter between David and Goliath. The young shepherd boy David rose to meet Goliath's challenge. He slew the giant from Gath with a slingshot. His victory inspired the Israelite army, and they set out in pursuit of the fleeing Philistines. Scripture records the Israelites pursued the Philistines as far as Ekron. Old Testament Bible maps capture the geography of these stories, and shed a light of understanding on the Biblical narrative. Old Testament Bible maps help shed light on the events and people found throughout the Old Testament. It is difficult to understand the Old Testament at times, and the different place names and locations are often hard to pronounce in their English translations. We hope these maps help shed light on the Old Testament, and the power of God. Feel free to print off any of these Old Testament Bible maps for your use. Www.israel-a-history-of.com hopes to illuminate and shed light on the mighty, and oftentimes mysterious, power of God found in the Old Testament.